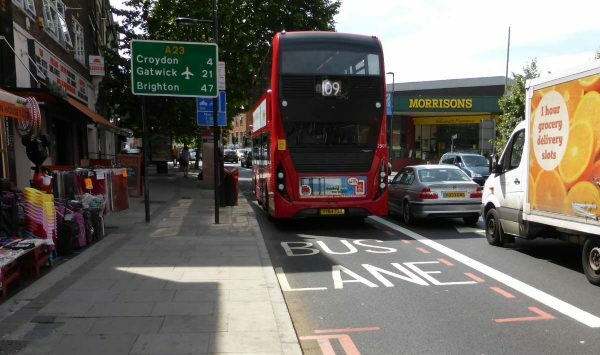 A bus lane is a lane reserved for the use by buses with a minimum number of seats and is marked by a thick white line. Different towns and cities have different rules about bus lanes. For example, in London and Birmingham the minimum number of seats is 10, but in Manchester, it is 9. Private hire vehicles are not permitted to use bus lanes. What other vehicles are allowed use a bus lane? 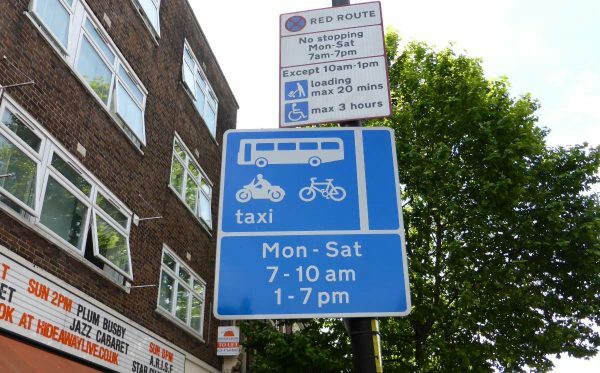 In London, licenced London taxis, motorcycles without sidecars, mopeds, scooters, non-motorised tricycles, motorised tricycles under 450cc and bicycles can use bus lanes. This varies from city to city, though, and can also include security vehicles transporting cash or bullion, postal vehicles, emergency services vehicles and some vehicles involved in road maintenance and monitoring. What signage shows that it’s a bus lane? As well as BUS LANE marked on the road, the blue sign will tell you the time restrictions and what other vehicles are allowed to use it. In this case, it’s a bus lane between 7-10am and 1-7pm from Monday to Saturday. That means between 10am-1pm and 7pm to 7am on Monday to Saturday, and all day Sunday, it can be used by any vehicles. Note that there is a supplementary clearway sign (no stopping) between 7am-7pm Monday to Saturday, too, as it’s a red route, except that vehicle loading and unloading can use it between 10am and 1pm for up to 20 minutes, and disabled drivers can park for up to 3 hours (this is not usually allowed in bus lanes). If it is a lane only for buses, it will say that on the sign. Bus lane operation times vary from area to area. 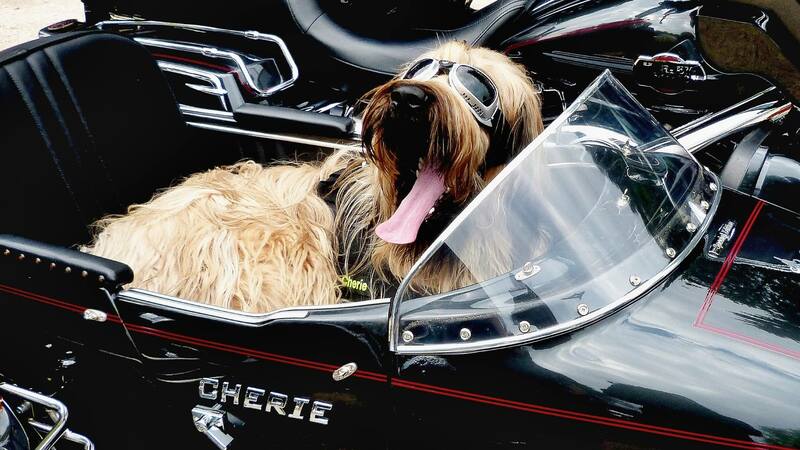 If no time is stated, the lane operates 24 hours a day. There may also be a temporary bus lane if an existing bus lane is closed for repairs. What are the penalties for using a bus lane when you’re not permitted to? When other vehicles use bus lanes it delays buses and increases congestion. You could receive a Penalty Charge Notice if you are caught driving or parking in a bus lane when you are not permitted. Are some streets reserved only for buses? Some towns and cities have streets which are only permitted for buses (and usually the other exempt vehicles). These are clearly marked on the road with BUS ONLY. Some junctions have bus gates which allow buses to pass through ignoring traffic lights or roundabouts. They will also be marked with BUS LANE. Can other vehicles cross the bus lane? If there’s a section of broken lines, vehicles can cross here. Vehicles can also cross a bus lane to enter or exit a driveway. Can other vehicles use a bus lane? You can use a bus lane if directed by police, to avoid an accident, to make way for an emergency services vehicle, to slow down to make a left turn or to avoid an obstruction or spillage in the road.